This girl gets crazier every day…. 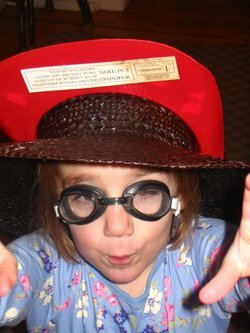 Today it’s black straw hat, red plastic fireman’s helmet, Dan’s swimming goggles. I think every child needs a pair of swim goggles in their toy box, if nothing else for the pure comic relief of their parents. I’m not even going to post the funniest of these pictures for fear that my readers would be concerned about the mental capacities of my oldest daughter. And finally, please say hello to a new crafty girl/mom in the blogging world. I met Carrie through Etsy. She sells REALLY cute screen printed tees for babies and a few other toys. I have a link to her store "A Vintage Child" on my sidebar. Tonight it my second to last pottery class. I will be doing lots of glazing tonight so that all my projects will be finished by next week. I’m sad for the class to be finished and I am feeling like, "Where do I go from here?". I am really enjoying pottery. Perhaps I’ll take another class, or get some advice from my aunt who is a very talented potter/tile-maker, as to where to go from here. I can tell I need a lot more time for trial and error. Since Dan didn’t have work today he gave me a few hours away this morning. It was nice, but for some reason, I still feel rushed to get back. I spent most of my time at the Goodwill store and found some great brown wool tweed for 99cents! I can’t wait to put it to use. Now Dan’s getting his time away–which I’m sure means he’s reading at a coffeshop and I must go pick up after the tornado that swept through "while mom was away." Oh how great you got a little break!That outfit is amazing. So fun. The bath mess…. oh i feeel for you. 🙂 It is going to be crazy having 2 little ones huh! 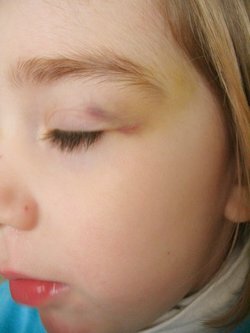 Poor Emma, I’m Jack hasn’t had a black eye yet, but he’s had lots of other minor injurys on his face, I always get paranoid that people think I’m beating him or something, even though I’m sure they all know that 2 kids get hurt alot. I like the goggles, good idea. Sorry to hear about your daughters eye! Since Nissa had fallen down, I feel like I have to explain what happened to her when we see people in public….like so they don’t think it was abuse or something. Well, now that I read some of your other comments, i guess it’s just like what Heather said! I have a pic. of one of my boys wearing goggles, a cowboy hat, his swim trunks and his rubber farm boots and fishing pole slung over his shoulder. That photo is so priceless to me. I know what you mean about not going out much with that bruise…my boys often had some kind of bump or scrape on their face! You just don’t want people to look at you side-ways!haha. oh my goodness, this photo is PRICELESS! love it. and love the shot of the bruised eye… boy, do I hate it when something like this happens to one of the kids… outside of the fact that you want to spare them any pain, there’s also that overwhelming urge to explain the accident in great detail to any and all strangers… yes, I’m thinking concealor might be a good idea! good for you with the pottery class…! I know what you mean, too– I took that collage workshop a while back and it was SO fabulous and I felt the same way… where do I go from here? I need another class or workshop or SOMETHING and unfortunately, that has been a little hard to find here thus far. hope you’ll find a way to continue on with it. looks like you’re making some beautiful things…!